Hundreds of Canadian mayors and city councillors are squeezing sightseeing onto their agendas as they visit Niagara Falls - many of them for the first time. Officially, the 2,000 delegates at the Federation of Canadian Municipalities conference are here to discuss issues like disaster preparedness and "raising money without raising taxes." But they're not missing the opportunity to take the sights of the World's Most Famous Address. Jenny Gerbasi, a Winnipeg city councillor, called the view from her hotel "mind-blowing" shortly after checking in. "The window was right up to the falls. The mist from the falls was coming in through the window," she said, describing her reaction to pulling back the curtain at her Marriott Fallsview room. It was her first visit to Niagara. When she first learned where this year's event was being hosted, she thought it was "cliché" because everyone has heard about the falls. But when she came face to face with the world-famous attraction, the waterfalls wowed her. 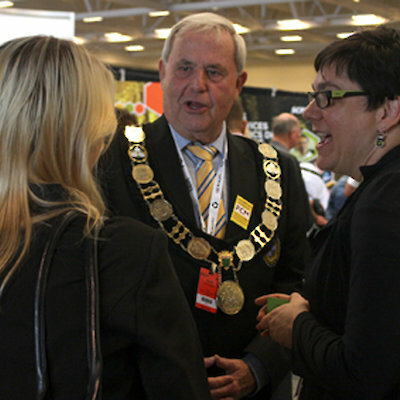 The five-day FCM conference hadn't begun Thursday afternoon, but many politicians said they arrived early to take in a slice of Niagara. FCM president Claude Dauphin, the mayor of Lachine, Que., arrived Wednesday, the day before the conference officially opened. Business is going to keep him close to the Scotiabank Convention Centre, he said, but his wife Maria Mazzuca whispered "casino," when asked if they had a chance to visit any attractions before the conference kicked off. Niagara Falls Mayor Jim Diodati said he loves the opportunity to show off his city to his counterparts from across the country. The mayor says he's using every chance he can get to promote the "buffet of entertainment" it offers, including the region's culture and nearby wineries. He says the impression municipal leaders have at FCM will turn into good publicity when they go back to their hometowns. Diodati said he told a group of chief administrative officers, "One time won't be enough. You'll have to come back with your families." FCM was one of the first big conferences Niagara Falls landed, in 2008, after local officials knew the Scotiabank Convention Centre was going to be built. The Stanley Avenue facility, which marked its third anniversary in April, gave Niagara Falls the ability to go after FCM and Canada's other big conferences, which normally rotate among Canada's big cities. For example, in the four years Diodati has been mayor, he has attended FCM events in Halifax, St. John's and Vancouver. Next year, Edmonton is hosting FCM. 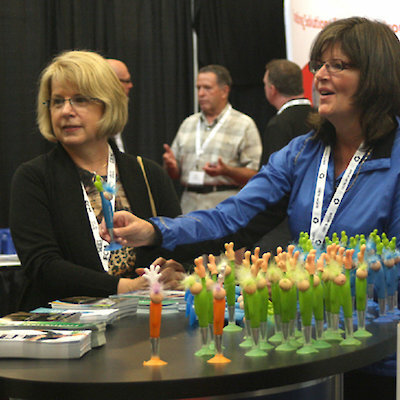 Niagara's bigger hotels have meeting and banquet rooms, but before the Scotiabank Convention Centre opened in 2011, none of the hotels had enough exhibit and meeting space to accommodate an event like FCM that brings thousands of delegates, exhibitors and volunteers to town. Every year, the Federation of Canadian Municipalities brings politicians and top-level bureaucrats together to talk about issues they have in common. This year's program includes sessions on how communities can adapt to climate change, how they can work together to improve rail safety, and how to boost trade and foreign investment. Many delegates are mixing business with pleasure, either by arriving early or by extending their stay once the conference winds down Monday. "We came last Sunday and we've seen a few things. It's great," said Wayne Nixon, the reeve of Stettler County, Alta., a municipality of 5,000 people southeast of Edmonton. Nixon said he has visited the Horseshoe Falls every day since he arrived and plans to do it every day he's here. He signed up for a vine-to-wine tour - one of the excursions that has been arranged for FCM delegates, while his wife Loree said she'll take a tour of Niagara historic sites. "It's quite different from Western Canada," Nixon said.